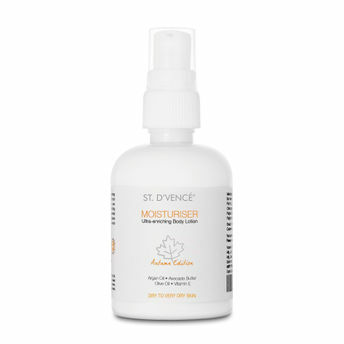 St. D'vencE Body Moisturiser Autumn Edition is a unique breakthrough blend of ten premium ingredients that royally nourish and hydrate the dry skin. Argan Oil - miracle liquid gold, is used to intensely hydrate, soften and bring in the natural glow of the skin. Avocado - butter fruit, native to South America is packed with twenty-five vital nutrients, including Vitamins A, C and E, proteins, fibre and minerals. With French Shea butter, it provides the best moisturising effect all day long. The blissful amalgamation of Avocado, Almond, Coconut, Jojoba and Olive Oil, intensely moisturises the epidermal layers and nourishes the skin while resulting in the removal of acne, wrinkles and stretch marks. With London's classic fragrance, this non-greasy moisturiser's every drop is an elixir. At a time of transition, autumn is the best time to rejuvenate and repair your skin by correcting any summer damage and preparing for winter. This is a moisturiser so good, we're sure you'll fall for it. Explore the entire range of Lotions & Creams available on Nykaa. Shop more St. D'Vencé products here.You can browse through the complete world of St. D'Vencé Lotions & Creams .Alternatively, you can also find many more products from the St. D'Vencé Autumn Edition Body Moisturiser range.